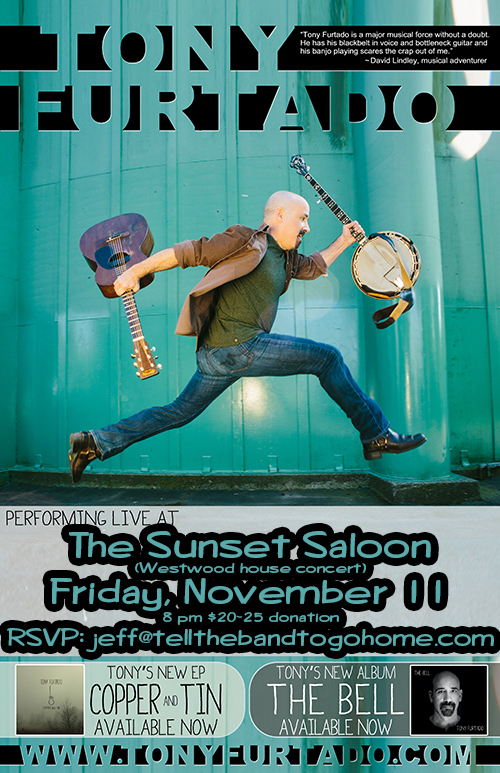 Home→Blog→Concerts→Tony Furtado at Sunset Saloon, Fri. Nov. 11! ← Luther Wright & The Wrongs, Rueben de Groot & Colleen Brown at Sunset Saloon, Nov. 3! In 1990, Tony signed a recording deal with Rounder Records, one of the country’s preeminent independent record companies. Beginning with Swamped in 1990, he recorded six critically acclaimed albums for the label, collaborating with such master musicians as Alison Krauss, Jerry Douglas, Tim O’Brien, Stuart Duncan, Kelly Joe Phelps and Mike Marshall. During this period, Tony also performed and recorded with the band Sugarbeat and the Rounder Banjo Extravaganza with Tony Trischka and Tom Adams. Tony has recorded and produced almost a dozen CDs for various labels such as Dualtone, What Are Records and Funzalo Records.